In Cairo University’s Great Hall the grandiloquence of the American President was lavish. That Obama is a great orator is well-known, but in order to understand the real message behind the rhetorical exercise, we need to take into account three things. The first is that US President is caught up in the most severe economic crisis since the Second World War with all the problems that brings, not least that of imposing on the American proletariat the usual polices of sacrifices. And not only that, he is hoping that this will be blindly accepted without the streets filling up with workers expressing their righteous anger. The second regards his attempt to present an image of the US which is more acceptable, in contrast to the threatening demeanour of the previous US Administration which created so many problems in its international political relations. The third, which is a consequence of the first two, is to breathe new life into the weakened US imperialist project, devastated both by the economic crisis, and a series of still unresolved military and economic defeats, which weigh heavily on the process of recomposition of global imperialism. In the light of these premises we can easily understand how his speech showed an undeniable need to present a discontinuity with the Bush Administration whilst at the same time maintained a continuity of foreign policy, even if expressed in a less arrogant tone. He attempted to re-present American imperialism as the pivot around which the peace process, and the more or less open confrontations in the Middle East, have once again to revolve. Discontinuity. President Obama was applauded for denouncing the imperialist content of the old US Administration whose economic and political responsibility for accelerating economic disaster and the decline of the US’ image with a series of heavy defeats (Iraq, Afghanistan, Pakistan, never mind the loss of its economic and political presence in Latin America and Central Asia), but he limited himself to criticising the forms which the stars and stripes imperialism used. Discontinuity here only means distancing himself from the political practices which made the USA one of the most hated countries in the world, an emphasis on the excessive use of force which undermines “democracy” (Guantanamo), even if justified by the exceptional situation of 11 September. Continuity. After which, Obama set out on the road of continuity, though starting from a different situation, and projecting an apparently more conciliatory tone. The basic thesis is the revival of the war against terrorism, the old war horse of the Bush Administration behind which the American imperialist enterprise in the Middle East is hidden. Not a word on the lies used to justify a series of wars to safeguard the economic strategic and energy interests of the US. Not a hint of the fact that terrorism was the best ally of the Washington in the eighties and nineties. The fine words of Obama’s speech don’t deceive us since the political content remains the same as before. And, though its true that the new Administration, rather leaden-footedly, is opening dialogue, talks of multilateralism, makes amends for some of the worst excesses of the past, holds out a hand to those countries which a few months ago were considered “rogue states” or rather considered enemies of the USA and obstacles to its imperialist ambitions, this does not means that we should think that the new Administration has renounced its role as economic and political world power. Iran. Obama has held out his hand, not to the government of the existing president, but to the political elements which could win power in the August elections and establish new relations with the USA. Relations, that is, which would presage the abandonment of nuclear development for military aims (the power with the atomic arsenal thus demands that it be the only one allowed to use it); the re-entry of Iranian oil into official circulation with all the advantages that would mean for American supplies and the distancing of the alliance with Russian and Chinese competitors. An outstretched hand which would be immediately withdrawn if American openness did not produce the required political response. In that case there could well be a return to the policy of sanctions and the threat of heavier reprisals. Iraq. 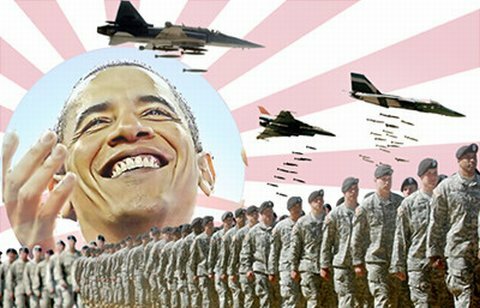 As already decided, American troops will completely withdraw from Iraqi territory by 2012. But only under certain conditions. On condition that the ‘freely’ elected government demonstrates itself capable of guaranteeing social and political order. That the oil makes its way to the USA before going to other countries and with preferential prices. That the Baghdad regime allies itself to America’s Middle East policies: otherwise the troops will be forced to remain with the usual excuse of defending democratic institutions from the daily terrorist threat. Afghanistan. In this case the new Administration has decided to reinforce its military contingent (40,000 men) and to increase its military budget by another billion dollars. On the one hand it is inclined to establish a dialogue with moderate Taliban forces, on the other it is continuing with the war. At stake is not, as they would have us believe, the necessity to defeat a Mullah terrorism - which was brought to power in ’94 and then ousted in 2001 because it no longer complied with America’s strategic interests - but the re-launch of an American presence in the management oil and gas from the Caspian which at the moment is securely in Russian and Chinese hands. Pakistan. The same goes for this other Asian pawn. Obama is trying to strengthen the key Kabul-Islamabad axis in the anti-Moscow, anti-Beijing strategy. The objective is still the same whether it’s pursued by good means - with dialogue and opening up towards adversaries - or by bad - that is, the continuation of belligerent activity. Israel-Palestine. The old story is repeated. As with the previous Clinton and Bush administrations, the Palestinian question reappears and disappears according to American imperialist calculations. The formula of ‘two peoples and two states’ has run through many political itineraries. From the Oslo-Washington accords, passing through Geneva, the Road Map and at least twelve international Conferences it has always remained key. Predictably, however, every time American imperialism has been on the point of attacking an Arab country - the first Gulf war, the second attack on Iraq, the war in Afghanistan, etc., - the various Administrations in turn, whether Democrat or Republican, have continually disregarded the obligation to give a state to the Palestinians even if it would mitigate the rage of the Arab populations and have a consensus of approval amongst the regimes of the Middle East. This time as well as the proffered peace the Obama Administration seems to be running along the old lines. It is very probable that the new president of the United States has the intention of finding a solution to the Palestinian question. First of all because it would bring him the domestic and international prestige which has eluded previous presidents. His idea is that the USA would emerge strengthened. Then the dominant position of the USA would be strengthened in an area of prime strategic importance. But the real reason for such an initiative resides, yet again, in the necessity to counter the Arab world’s reticence over American military activity in Iraq, Afghanistan and Pakistan. Success with the Palestinian question, with all the necessary guarantees for Israel, would open the way for the USA in its attempt to re-establish itself in Central Asia, an area from where the US has been excluded by Russian-Chinese agreements with Kazakhstan and Turkmenistan. The Nord Stream pipeline running under the Baltic Sea which will bring energy to Germany and thence to the rest of Europe, and the South Stream which will come to the south, to Greece and then Italy, are apparently almost complete. Meanwhile the Nabucco project, under American leadership, is still in deep water. This will supposedly be the alternative to the Russian routes as well as compensation for the partial failure of the BTC (Baku-Tiblisi-Ceyhan) pipeline which should have received Kazakh oil but which in reality has to make do with Azeri. The single obstacle to Obama’s Middle East project is the present Israeli government which does not want to be the designated victim of the US plans and is intuitively manoeuvring against it. The head of the Tel Aviv government immediately responded by refusing any plan which foresees the birth of a Palestinian state - at the most he is prepared to speak of administrative autonomy in the occupied territory - nor is he prepared to stop the settlements on the West Bank. He has rejected this but then denied the rejection but this is all part of the game which is only aimed at settling the Iranian threat. In others words if the Obama administration had really intended to follow this plan the Israeli government would have turned it upside down creating a crisis in a sensitive area, the Persian Gulf. Besides the threats, Obama’s inclination is to continue to pursue the imperialist strengthening of the USA, with a few carrots compared to the previous administration but at the same time tightly gripping the same old stick. The Commune - A Radical New Grouping or Old Left in a New Form?